Paul Newman is known for a lot of things. He’s an icon — an award-winning actor best known for his work in movies like The Color of Money, The Hustler, The Sting, Butch Cassidy and the Sundance Kid and more. Newman was also a director, and an outspoken activist and philanthropist. He was even known for his salad dressings, and his passion for race car driving. But for all this man did, only one thing got a Rolex named after him. When Rolex first introduced the Daytona, a watch inspired by racecar drivers and named after the famous Florida track, it wasn’t a big hit. Back in the day, the watch sold for a couple hundred bucks, and the face didn’t resonate with the general public. Then, Paul Newman was spotted wearing one. The world-famous actor was also into racecar driving, and for that, the Daytona served a purpose. Soon, watch retailers around the world were able to sell dusty Daytona’s off their shelves by calling them the “Paul Newman Daytona” watch. Instantly, the Daytona became a hit. Today, it’s one of the most recognizable watches in the world. Although, it is important to note that Daytona stands for a line of high-performance luxury timepieces, not a single model. There are three distinct series, the first being the smallest and beginning in 1963 and lasting through the 1980’s. During the first series, all models were given a four-digit model number and featured a manual-wind movement. This is also the most important (and today, most valuable) series because so few were made. Plus, this is the original Daytona that Newman made famous. The second series is categorized as the generation after Newman made it a hit. The series began in 1988, and with it came automatic winding and a new five-digit model number that lasted until the year 2000. Today, we’re in the third series with self-winding chronograph functions and a six-digit model number. Although the first series are amongst the rarest and most expensive watches to date, the second and third series are further proof that Newman’s stamp of approval is all this watch needed to catapult it to stardom. This is a Paul Newman Daytona, a highly coveted watch. As we mentioned before, the first series is the only series of truly ‘Newman’ Daytona’s. If you’re looking to verify a Newman Daytona, you’ll need to have a reference number of 6239, 6241, 6262, 6263, 6264 or 6265 to be sure it’s the real deal. Another way you can tell if it’s an original Newman Daytona is if the domed crystals are made of acrylic. The sub-dials also have block markers instead of the more modern lines, and each sub-dial also has crosshairs placed on them. 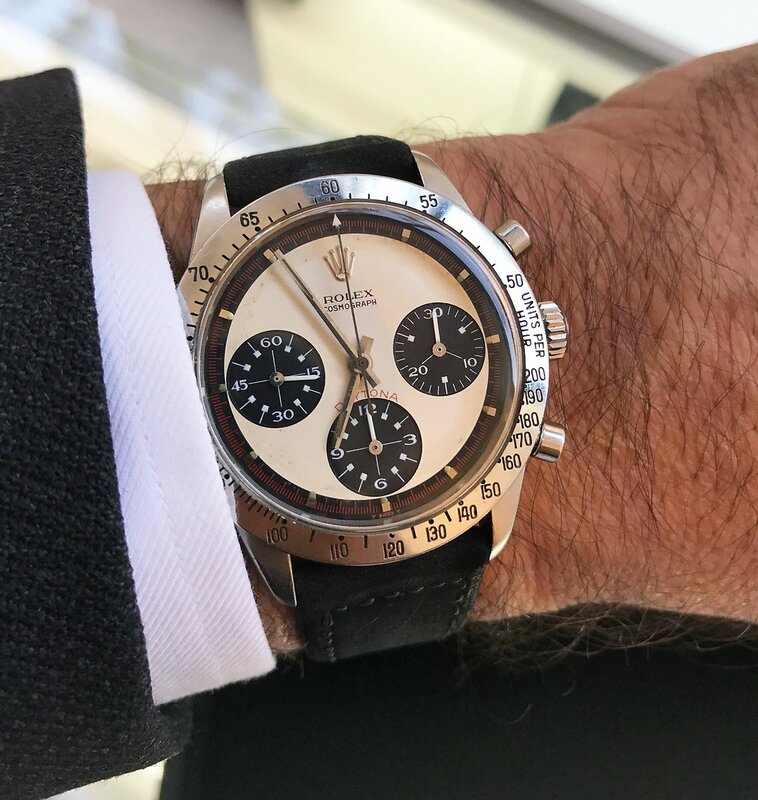 Finally, be sure to check out that second sub-dial — a real Newman Daytona will be marked with 15, 30, 45 and 60 (whereas the newer models are marked at 20, 40, 60). Here is the actual Paul Newman Daytona that Paul Newman wore. 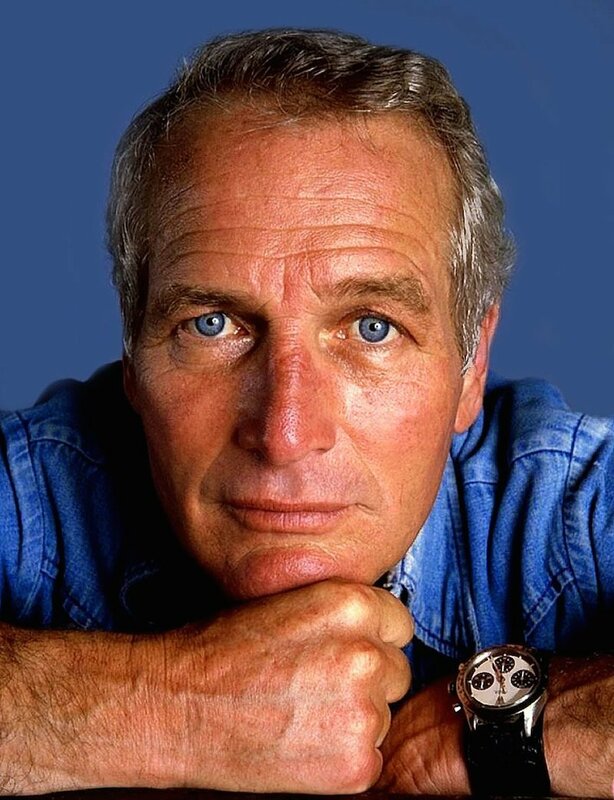 Back in October of 2017, Paul Newman’s very own Daytona went up for auction and fetched $17.8 million dollars — making it the most expensive watch to ever be sold at auction. Let’s take a look at the specs. The one that sold was a 6239 featuring a 300 units-per-hour, stainless steel bezel, pump pushers for the chronometer, a Valjoux 722 with 17 jewels that ran 18,000 beats-per-hour movements. 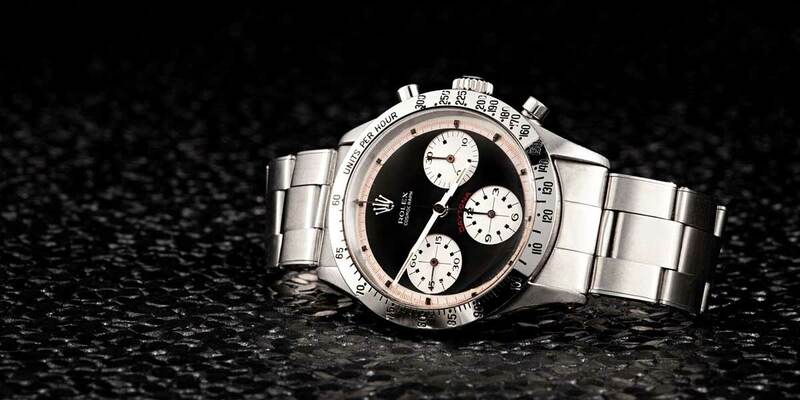 This was also the first Daytona model that moved the tachymeter scale from the dial to the bezel. This original was available with both black and white dials, but you can see here, Newman preferred the black. You can also see the very detailed, beautiful red that reads out ‘Daytona’ stretched across the sub-dial above six o’clock. There’s even that rare, beautiful red in the outer minute track. Then, there are the more personal touches. The watch was originally gifted to Newman by his wife, Joanne Woodward, and on the back you’ll read, “Drive Carefully, Me.” clearly inscribed. Finally, you it can’t go without mentioning that this watch sat on Newman’s wrist for decades. Just imagine all that watch has seen and done. With that being said, it’s almost ironic that a man so timeless will forever live on in the name of a timepiece. Despite this, we can’t see it being any other way.